The Huh? 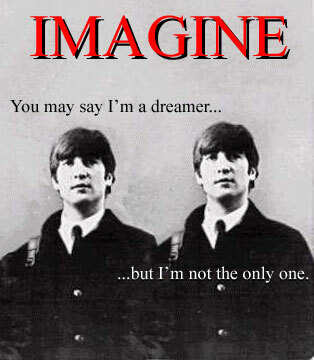 : Imagine a John Lennon Clone... From a Tooth. I read about this on not just one other website, but a few. Apparently Canadian Dentist-slash-Beatles-fan Michael Zuk spent something like $30,000 to buy one of Lennon's molars that had been removed- and now is working with US researchers at an unnamed laboratory at Penn State to see if they can clone him, or at least what can be done with the DNA. I couldn't help but make this image- the lyrics are just too fitting. "I am nervous and excited at the possibility that we will be able to fully sequence John Lennon's DNA, very soon I hope," Zuk said. "With researchers working on ways to clone mammoths, the same technology certainly could make human cloning a reality..."
Assuming they can extract the necessary sequences, would this even matter? It wouldn't quite be "bringing back one of Rock's greatest stars" as Zuk thinks. A clone doesn't get all the influences that the original had, all the distinct circumstances that shaped him. The potential clone's experiences and life building won't be the same. Times change and with the ridiculous modern era of music we could end up with a monster like Justin Bieber. A Lennon clone could have all the inherent talent (latent familial traits, etc) but no focus or drive to create. Seriously, wasn't part of Lennon's inspiration to break out of the "normal system?" And as Lennon was part of the Beatles, the clone won't get the tremendous influence of George Harrison and Paul McCartney (and I suppose Ringo Starr as well). There would be all the potential, but none of the rest. I mean, what if he wanted to be a painter instead? This potential clone would be their own individual, and would make their own choices, with their own rights. Sure, the body will be the same, but the mind and whatever else makes us, well... us, is individualized. Labels: art, ideas, news, WTF?